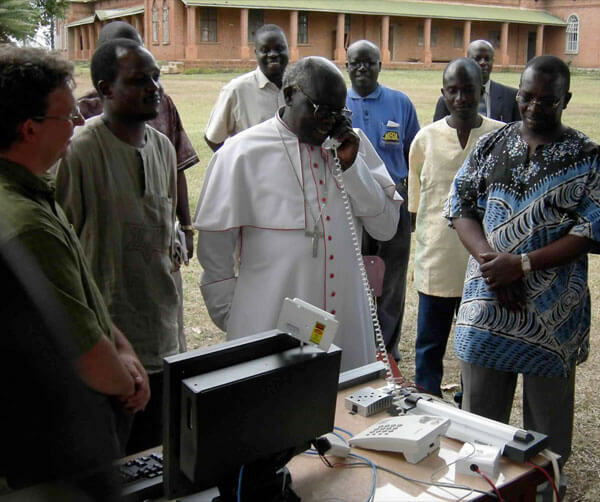 In 2007, Ugandan Archbishop Odama places an internet phone call to an internally-displaced people's camp 70 km away. Internet technologies are encouraging ground-up development like this across the continent. Photo courtesy Bosco-Uganda. I first stumbled across BOSCO-Uganda in July 2008. I was nearing the end of my internship with the Women of Uganda Network and was becoming increasingly interested in what is being called information and communication technology for development or ICT4D. BOSCO-Uganda introduced me to the idea of using basic technology developed in the Western world for community development in completely different cultural and social settings. In particular, they were using the Internet was giving young people access to a whole breadth of information never reached before: from grant-making agencies to international news. Just over a year later, I decided to check in with Kevin Bailey, Organizational and Communications Envoy with BOSCO-Uganda, to see how the organization was growing. For some background material, check out my previous article here. Since 2008, BOSCO-Uganda has grown exponentially. The organization now covers a total of 20 different sites, providing wireless Internet access and free satellite phone connections. With support to a local HIV/AIDS community based organization, a local Catholic Radio Station and a local government office, among others, BOSCO-Uganda has also started riding the Web 2.0 wave. “We think that if users begin using Web 2.0 collaboration tools as a starting point, they will learn how to use the basic skills like word processing in the process (imagine a user learning to word processing skills by sending emails and making blog/wikispace posts),” he continues. Trainees have already started using their new knowledge and posting at www.bosco-uganda.wikispaces.net. BOSCO also hopes to use their technology to teach adult literacy and numeracy. When I first spoke with BOSCO last year, they mentioned that teaching people computer literacy was difficult as they did not have the staff capacity nor scope. However, with new funding from UNICEF, it looks like their mandate is expanding. “The idea would be to digitize the curriculum, put it on our high speed server, provide a set of low power netbooks and allow a literacy teacher to hold community literacy classes while the students learn using the computer as the tool to gain those literacy skills,” says Bailey, who also believes the use of computers will encourage people previously too shy to come forward due to stigma around illiteracy.